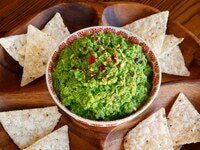 Spring Pea Guacamole – Recipe for light and healthy guacamole-style dip. Lower fat alternative to avocado guacamole. Made with spring peas, jalapeño, lemon, herbs and spices. 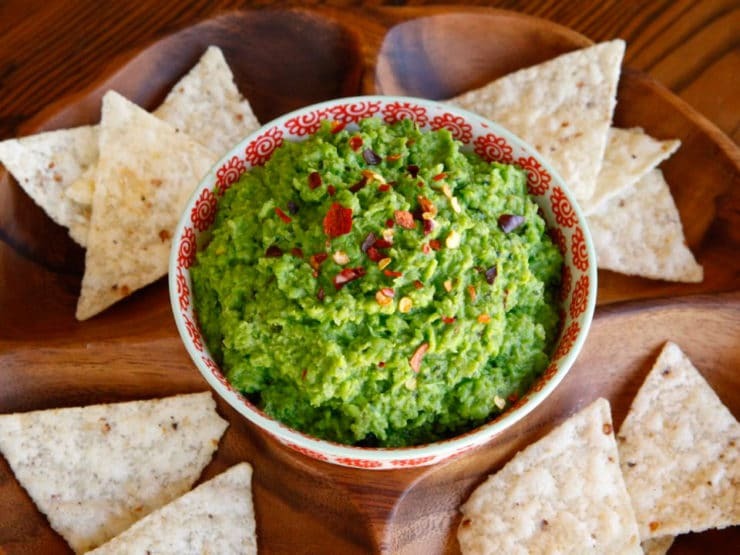 Spring Pea Guacamole? Some of you might be shaking your head right now. Trust me, it’s not as weird as you might think. I’ll explain… but first, a little history! Peas are a harbinger of spring. They first arrived in America by way of England during the early 1600s. Peas are early bloomers, they are one of the first crops to be harvested from the garden each spring. Thomas Jefferson was a fan of peas and grew around 30 varieties in his garden at Monticello. According to his family history, Jefferson was the originator of the Charlottesville neighborhood pea contest. Whoever produced the first peas of the season would host a community dinner with at least one dish containing the newly harvested peas. I love this idea! My assistant Ashley and her boyfriend Gary, a culinary school grad, shared this Spring Pea Guacamole recipe with me. 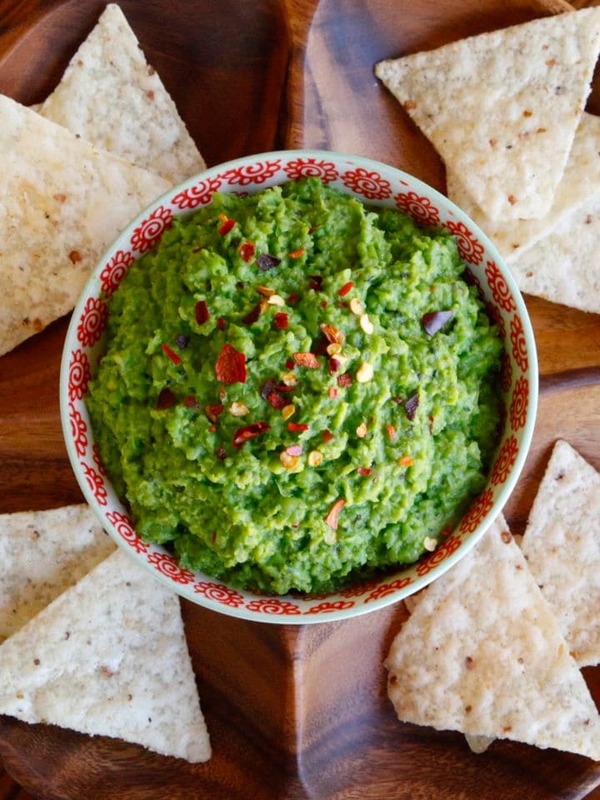 While peas and guacamole might seem like an odd combination, this whole concept works surprisingly well. The inspiration came from a restaurant where they used to work, which served a similar dip. When I first heard the idea of substituting green peas for avocado, I cringed a little. Why mess with something classic? Then I tasted it, and I got it. It’s really very tasty– not like avocado guac, exactly, but pretty darned close. The pea version is a bit sweeter than regular guacamole, which I actually liked. This version is lighter and much lower in fat than traditional guacamole. It will stay a bright green color, unlike the avocado version which tends to brown, so it’s perfect for serving at parties and buffets. Green peas are high in vitamin K, they’re loaded with antioxidants and anti-inflammatory benefits, and they also support blood sugar regulation. In addition to all of this, they taste like spring! I wonder what Thomas Jefferson would have thought about this sweet and spicy spring dip? 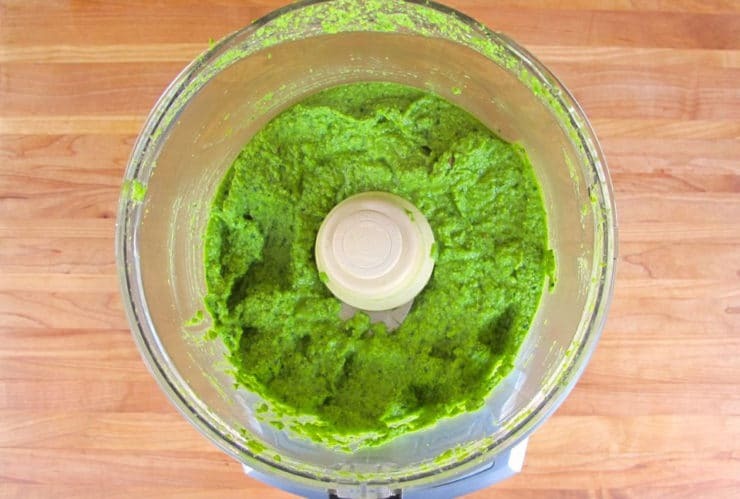 In a food processor, combine all ingredients and pulse until you reach a guacamole-like consistency (pureed but with texture). Scrape down the sides with a spatula as necessary. Adjust salt and red pepper to taste, if needed. Sprinkle the top with some red pepper flakes before serving (adds spice). This dip can be served chilled or at room temperature depending on preference. 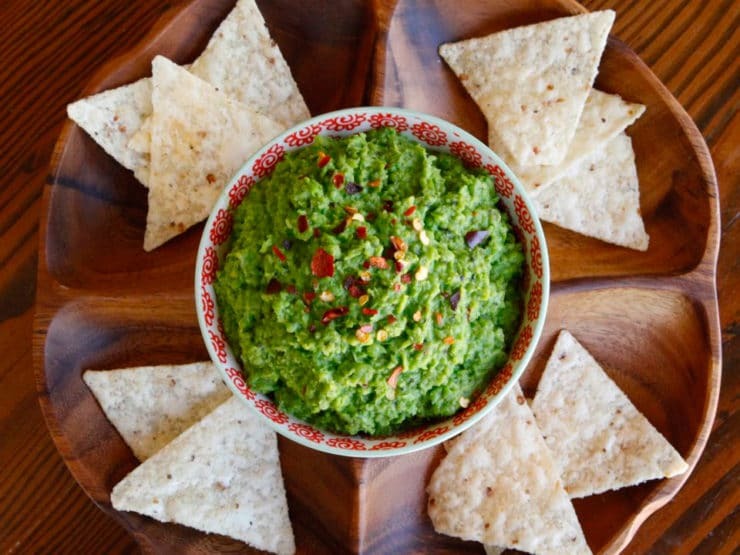 Try it with tortilla chips, pita chips, crudités, or anything you like to dip in traditional guacamole. Use gluten free dippers if you're keeping this recipe GF. I added one avocado to the mix. Lots of happy eaters at a local Wimbledon summer party yesterday! Haven’t tried yet but I’m allergic to nuts, citrus and gf any suggestions for replacing the citrus? HI Margalith, Tori’s assistant Ashley here. I’ve read that you can replace citrus with vinegar, perhaps apple cider or white wine. Unfortunately we have not made this recipe with the replacement, but it might be worth a try! You can also try it without and see how the flavor is. I made this for Easter yesterday – I spread it on thin flatbread crackers and topped it with rainbow radishes. So pretty! Everyone loved it. I don’t know what the word for spring peas is in Aztec, but guaca is avocado. Just saying…… Mole means paste. As an Lapsed Chef, I really enjoy your posts. This is something that I have made and yet, with your inclusions even better. I prefer a blender to a food processor and add 1/2 tbl of worcester sauce for dencity… Great in the A.M on toast and a poached egg. My family loves guacamole, but I would love to cut down on the fat content. Has anyone tried mixing avocado with the pea mixture to make a half and half recipe? I did .. I added a little extra lemon and salt..delicious. Due to a health issue that I’m dealing with, I can’t eat more than five grams of fat per meal so avocados (though I love them!) are definitely out of the picture. This is perfect because I miss guacamole so much. Thank you thank you! I’ll try it today! Thanks so much for this. I’m a retired American living in Nepal and if something’s out of season there is no way to get it. Sometimes I miss recipes like guacamole.Even when avocados are in season I have to go all the way to Kathmandu. I have a guest house, so I’m always looking for signature dishes to serve guests. We have one so far, a healthy, high protein pancake recipe. I’ve been looking for something to serve with coffee or tea when guests arrive. This might be the thing I’ve been looking for. I’m enjoying your recipes and history posts. All these new versions made me wonder how it would be to add some techina to a basic avocado recipe for guacamole. My boss makes something similar we in the office just call “Pea Mash”. This will be a great new version! Very interesting and looks delicious! Great recipe. You could even go half and half … avocado and peas … if lower fat is your issue and not an allergy. I did 1/2 & 1/2. Great for my at home snack. Looks great! 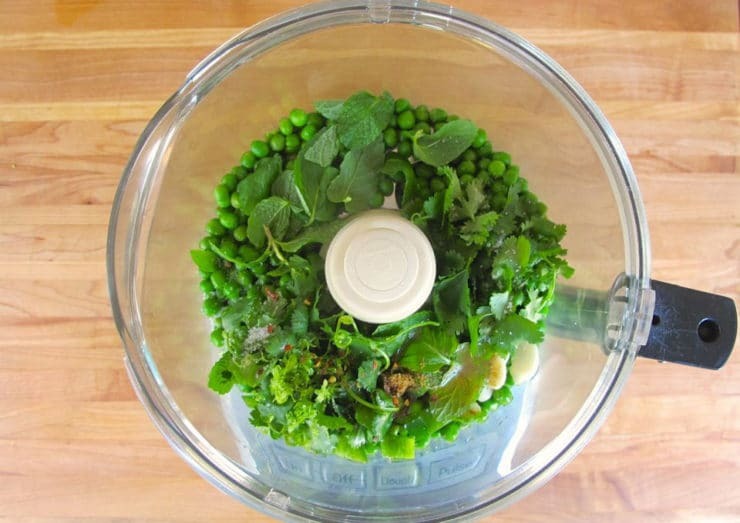 Is it necessary to steam the thawed peas, or only if using fresh peas? I MUST try this!! Thanks for the recipe!! I’m allergic to avocado so I look forward to trying this recipe! A fix for those with food allergy to avocado. Tori, You could also substitute avocado oil for the olive oil, and people who do not like cilantro can substitute parsley. I will have to try this myself. so you serve it chilled? I sure can’t wait to try this! This sounds yummy. I would eat it and regular avocados. Could this be made using fresh garbanzo beans? The garbanzo version is hummus! For someone with an aversion to the avocado, this is great! Tori, please tell your husband to kiss you on the lips for me! I have dearly missed guacamole since I developed an allergy to avocados in my late teens. Finally, an agreeable substitute!! Especially since I grew up eating them almost daily. Used to love them mashed on whole wheat with pepper and lemon juice. That looks incredible, and wow what an awesome picture. sounds interesting…I love my avocados, but I’m willing to give this a try! Mini sandwich for kids. Add sweet red pepper. I don’t eat avocado, so I’m really excited to try it! avocados are good for you.